Edith Marie Collins, 94, of Fort Scott, passed away at her home at Presbyterian Village Wednesday morning, January 23, 2019. She was born November 28, 1924, in Metz, Missouri the daughter of Charles Floyd and Grace Mertie (Saul) Charles. She married Lewis F. Collins April 21, 1946, in Fort Scott, Kansas. Edith graduated from Metz High School in 1942 and was involved in basketball and orchestra. She went on to receive her nurses training in Fort Scott, graduating in 1945. She served her community in the Cadet Nurse Corps during WWII. Edith worked as a nurse in the Fort Scott area for many years, mostly in the OB Department at Mercy Hospital, for thirty years. 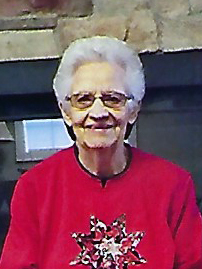 She was a member of Bethel Community Church, and a TOPS Charter Member & Weight Recorder for over fifty years. After her retirement Edith cared for her husband until his death in 1984. She traveled to all fifty states as well as Europe and Asia. She enjoyed sewing and crocheting, and she volunteered at the Mercy Hospital Gift Shop. Edith is survived by her children; two sons, Tom Collins and Anita of Eagle Rock, Missouri; Bob Collins and Cherie of Fort Scott; a daughter, Kathy Hixon and Steven of Bartlesville, Oklahoma; nine grandchildren, Nathan Collins of Fort Scott, Melinda Morgan of Wichita, Kansas, Melissa Wise of Fort Scott, Meredith Anstine of Garden City, Missouri, Julie Rankin of Shawnee, Oklahoma, Stephanie Klemm of College Station, Texas, Matt Hixon of Seattle, Washington, Jimmy Bolinger of Uniontown, and Jason Bolinger of Fort Scott; a brother, Ellis Charles of Emporia, Kansas; ten great-grandchildren, and two great-great-grandchildren. In addition to her husband Lewis, Edith was also preceded in death by her parents, a brother, Floyd Charles, a sister, Lois Charles, and a daughter-in-law, Carolane Collins. Pastor Ben Heffernan will conduct funeral services at 11:00 a.m. Saturday, January 26, 2019, at the Konantz-Cheney Funeral Home with burial following at the Centerville Cemetery. Memorial contributions may be made to the Bethel Community Church and left in the care of the Konantz-Cheney Funeral Home, 15 W. Wall Street, PO Box 309, Fort Scott, KS 66701. Condolences may be submitted to the online guestbook at konantz-cheney.com. Anita and Tom I send my condolences. I pray Almighty God will bless you and guide your family thru this time of need. God Bless you all.